Friederich Nietzsche’s Untimely Meditations, 1874, an early work by this major philosopher with author’s presentation inscription. Friedrich Nietzsche. Unzeitgemässe Betrachtungen. Zweites Stück: Vom Nutzen und Nachteil der Historie für das Leben. [Untimely Meditations, Part II]. Leipzig: E. W. Fritzsch, 1874. 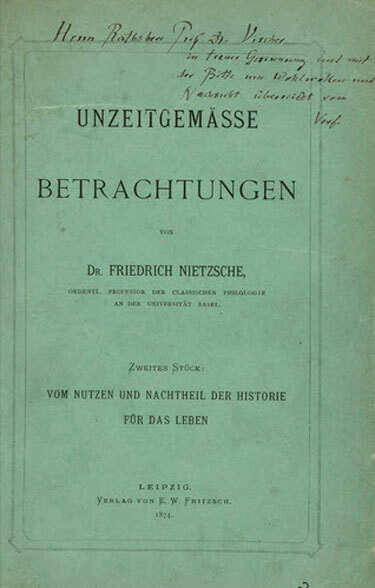 First edition of the second work (of four completed) in Nietzsche’s Untimely Meditations series, this being on the subject of history; association copy, inscribed by the author on the front wrapper to Wilhelm Vischer Bilfinger who appointed Nietzsche, sans dissertation, to the First Chair of Philology at the University of Basel: “Herr Rathsherr Prof. Dr. Vischer / in treuer Gesinnung und mit / der Bitte um Wohlwollen und / Nachsicht überreicht vom / Verf.” Octavo (8.75 x 5.5 inches; 223 x 140 mm.). 111, [1, printer’s note] pages. Twentieth century green cloth, spine lettered in gilt; edges sprinkled gray; patterned endpapers; publisher’s bluish green wrappers laid down and inserted. Spine gently leaning, spine ends and corners very lightly worn; boards very slightly splayed with a touch of soiling. Front endpaper with some light pencil erasure causing some minimal bruising; wrappers very lightly soiled; front wrapper with a couple horizontal closed tears, expertly mended when laid down, just a single letter of the inscription affected (the “N” in “Nachsicht”); rear wrapper with some paper filled in in the gutter margin; title-leaf faintly browned; text-block with some trace foxing. Near fine. Dr. Vischer died shortly after publication, in July of 1874, making this an early presentation. Carl Pletsch. Young Nietzsche. New York: 1991. pp. 99-100. From the Marilyn R. Duff Collection.